We employ a personalized style that approaches chronic conditions with a focus on finding core imbalances or underlying root causes rather than simply treating the symptoms. 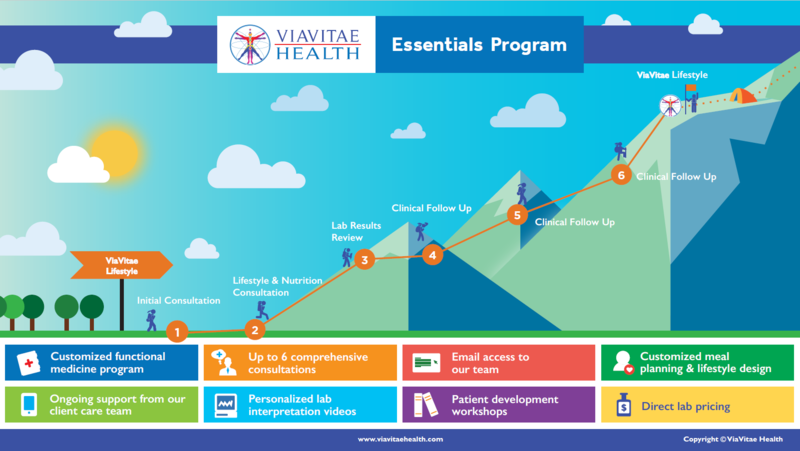 At ViaVitae Health, you’ll be actively working as an integral part of the team to ensure your fastest return back to health. 1. We do not treat diseases. We co-create health. 2. All disease starts and ends in the gut. 3. The patient determines the outcome. We look at the whole picture from lifestyle down to the cellular level, determine root causes and then create strategies and solutions accordingly. We provide care over the course of 6-8 months depending on the severity of your situation. Most of our patients experience significant improvements in their health within a few weeks of starting to work with us. In-depth 60-minute intake visit with your doctor to review your comprehensive 45 page intake form. We feel this is one of the most important aspects of this program. By taking better care of yourself, you can lead your family to better health. 80% of your clinical outcome is based on your nutrition and lifestyle strategy. We therefore emphasize lifestyle and nutrition throughout the process and teach you effective strategies to maximize your odds of health success. Another reason why so much emphasis is placed on this aspect is that significant changes in lifestyle can also minimize the amount of supplements needed while on the program. Direct email contact with your doctor and coach for quick conversations. Access to your practitioners and keeping an open dialogue throughout your program maintains momentum and improves compliance. Each lab test provides us with detailed clinical data and insight into your cellular health. We want to make sure that you fully understand your lab results and how they pertain to your condition. This also gives you the ability to easily share them with other members of your healthcare team. Most importantly, the video lab interpretation allows you to become more involved in your care. We believe that an informed patient who understands their body and how it’s working will become more of an active participant in their journey and will achieve much better long-term results. Knowledge + action = true power! Supplement recommendations are targeted based on specific needs or nutrient deficiencies found in the lab test results. We only work with the highest quality products to ensure more predictable outcomes. Supplements do not replace lifestyle or dietary changes. That’s why they are called supplements, not replacements. They are used as corrective tools to get you to a better place. Our goal is to use the least amount of supplements as possible by focusing on lifestyle changes. Wonder If ViaVitae Health Is Right For You?